A modern one bedroom apartment in a particularly nice position in the development - second floor with outlook to Penryn town and river to be enjoyed from a balcony. A town centre location with allocated parking and available with no onward chain. THE LOCATION Penryn is enjoying something of a renaissance witnessed in the regeneration and development of Penryn's inner Harbour area providing riverside accommodation and extensive and exciting dining options. Penryn Campus is occupied by both Falmouth and Exeter Universities sharing buildings, facilities and services as part of the combined universities in Cornwall project; this recent transition into a University town is creating a real 'buzz' for the area. Falmouth town (approximately 2 miles) provides comprehensive shopping, schooling, business and leisure facilities and was recently voted 'the best place to live in the South West' in the prestigious Sunday Times guide. 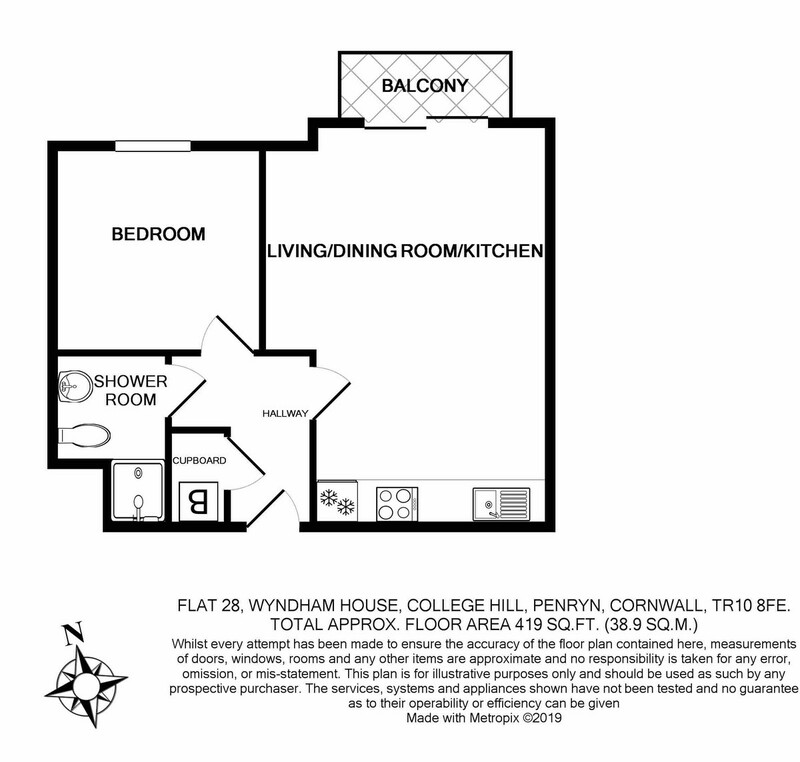 THE PROPERTY Wyndham House is a modern purpose built development which is very well thought of and with good reason to. Well spaced out from it's neighbours and complete with plenty of private parking and large communal garden. This second floor apartment is particularly well located on the second floor filling the rooms with light and enjoying an outlook to town from the inside and down to Penryn river from the good sized balcony. All is well presented throughout the open plan living space, double bedroom and shower room - benefitting from a fully fitted kitchen with appliances and good storage options (rarely seen in modern apartment buildings!). Now available with no onward chain, a great first home, holiday residence or profitable investment. ENTRANCE HALLWAY Entrance hallway providing access to all areas of flat. Carpet, power points, lighting, fuse board, useful large storage cupboard also housing water tank with shelving above. OPEN PLAN LIVING ROOM 19' 1" x 13' 5" (5.84m x 4.09m) Lovely light open plan living space with double width glazed sliding door to timber decked balcony with glazed rail. Majority of room is laid with carpet with vinyl in the kitchen area. Space for lounge and dining, TV point, phone line, intercom phone system, thermostat, lighting, two radiators. Kitchen set against rear wall comprising; base and eye level units, worktop, basin and drainer, electric oven and four ring hob, extractor over, tall fridge/freezer, washer/dryer. BEDROOM 9' 10" x 9' 7" (3.00m x 2.94m) Double bedroom with window to front aspect. Carpet, radiator, power points, phone line, lighting. SHOWER ROOM 5' 4" x 5' 1" (1.65m x 1.57m) Good sized shower room; vinyl flooring, heated towel rail, extractor, fitted cupboards, basin, low level flush WC, shower cubicle with glazed door, mirror, shaver points, main lighting and spotlights. COMMUNAL GARDEN Accessed by the residents off the first floor balcony is the rear southerly facing lawned garden which can be used by any of the residents. The huge benefit from this apartment is that this lovely space can be accessed directly from your own private decked terrace. PARKING Parking is private for the development, not with allocated spaces each but more than ample for all residents.